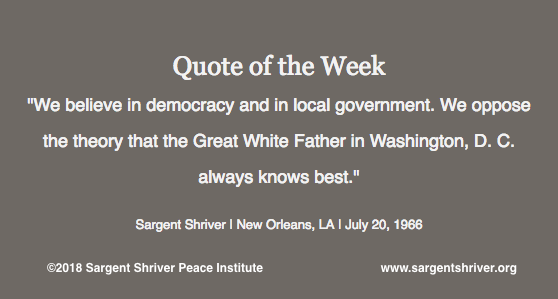 Our Quote of the Week shows Sargent Shriver's awareness of the diversity of the communities that make up the United States, and his profound belief in the right to self-determination. In a speech given during his tenure as Director of the Office of Economic Opportunity (the administrative office of the War on Poverty), Sargent Shriver addressed an association of counties in Louisiana. During the speech, he stressed the importance of having communities govern themselves in a truly democratic fashion. He also dealt with concerns that the War on Poverty would impose rigid rules or requirements on citizens wanting to participate in local programs. Sargent Shriver objected to a centralized, cookie-cutter approach to the programs. He believed in having community leaders devise solutions to local challenges, and he wanted to provide resources to allow those communities to empower themselves. It should be noted that the notion that people should govern themselves on their own terms was also at the root of the Peace Corps, an institution that Sargent Shriver had successfully built from the ground up by this time. We hope this quote resonates as deeply with you today as it did with us. As we watch an increasingly diverse pool of political candidates run and win in local elections around the country, we cannot help but feel inspired. The growing interest in citizenship and public service is a powerful reminder of one of Sargent Shriver's core beliefs: that it is up to each of us to ensure that our communities become more inclusive, and that our leaders represent the needs of those communities diligently and faithfully.